After five years of trying to bring the project about against the opposition from local residents, Chevron had to withdraw; the Tha Sa La community was named as the winner of the National Health Commission (NHC) award for 2013. Chevron is the largest foreign operator of oil and natural gas production in Thailand. In the Gulf of Thailand, Tha Sala district, Chevron has been planning a port and chemical storage site which would handle oil from the company's oil drilling and exploration work in the Gulf. Under Article 67 (2) of the Thailand Constitution, Chevron has to conduct an Environmental and Health Impact Assessment (EHIA) because such a project is judged to potentially be harmful to the environment. When they submitted the final EHIA, a panel of experts of the Office of Natural Resources and Environmental Policy and Planning (ONEP) approved the report on 11 September 2012. Before that, the panel had rejected Chevron's report seven times and now backed it saying that the company had taken additional measures to mitigate impacts. When the report passed the panel, a complaint was filed by the National Human Rights Commission (NHRC), claiming the report had distorted facts and used outdated information. The NHRC commissioner also stated that the report did not adhere to academic standards and that it could therefore be opposed. In addiction Somporn Pengkham, director for health impact assessment coordinating unit of the National Health Commission Office (NHCO), demanded the ONEP reveal the final EHIA report that the scrutiny committee approved on Sept 11. She doubts the completion of criteria by the scrutiny committee and she said she had followed up the making of the EHIA report and surveyed the ecosystem of Tha Sala Bay with community dwellers since 2008 and found that the ecosystem was unique. There are over 200 kinds of fishing resources, the sandbanks that are the breeding grounds of aquatic animals and the sources of fishermen’s living, and the coral reefs where fishermen make their livings in a 20-kilometer radius. However, the company studied impacts in a radius of only five kilometers from Tambon Klai and this does not cover outer fishermen. Meanwhile local residents, including fishermen, had continued to oppose the planned construction of the port, saying that it would damage their livelihoods. They said that thousands of families working in the seafood business would be affected. Residents also feared that the deep-sea port could change water currents and lead to coastal erosion. Backed by independent researcher Prasitchai Nunual, local residents were able to conduct their own report which they submitted to ONEP for comparison with Chevron's report. More than 100 meetings were held during one year of drafting the so-called Community Health Impact Assessment (CHIA) report to gather information about marine resources and the locals’ livelihoods that would be adversely affected by Chevron’s project. The Constitution also asks for the Independent Commission on Environment and Health (ICEH) and the Marine Department to hold a public hearing before pushing the project through. When the public hearings to draft the EHIA were held, most residents of Tha Sala had walked out, according to Prasitchai. When as little as five residents accepted the EHIA, it was considered enough support to make the report legitimate to ONEP. Prasitchai stated that the report may be illegal. On 6 November 2012, the head of the subcommittee on community rights under the National Human Rights Commission organized a forum at Walailak University in the province in response to villagers' complaints on the EHIA of the project. There, the subcommittee on community rights inquired about many matters from the representative of the ONEP. They include the question if villagers’ request for the protection of Tha Sala Bay will be approved before the port is completed for the sake of local communities and inquiries about measures to contain the negative impacts of dredging. The ONEP representative said that cutter suction dredgers and silt curtains would be applied to protect ecosystems during the dredging of navigation channels. Three sides of silt curtains will be used to form a U-shape structure to limit the thickness of silt at one meter from original sea floors and their installation must be completed in eight months. During the forum, Paranee Sawasdirak, a member of the Civil Society Planning Network, said the project site of Chevron in Ban Bang San village of Tambon Klai in Tha Sala district was one of areas designated by the city planning draft of Nakhon Si Thammarat that was already approved by the Tha Sala Tambon Administration Organization. The location is defined as a green area where industrial activities and the transportation of chemicals are prohibited and the draft is undergoing a process to be announced in a royal decree in 2012. After five years of trying to bring the project about against the opposition from local residents, Chevron announced in December 2013 it had cancelled the port and shore facility. At the beginning of 2014, the Tha Sala community was named as the winner of the National Health Commission (NHC) award for 2013. The NHC secretary-general encouraged other affected communities to follow the Tha Sala people's footsteps by conducting community health impact assessments themselves too in order to support their cause. Project Details The project would include a 33 meters wide deep-sea port, stretching 300 meters out into the sea, located within 500 meters off the shore to aid its oil drilling and exploration work in the Gulf of Thailand. A chemical storage site would also be built at the location. The project would take 18 months to complete. Why? Explain briefly. After five years of trying to bring the project about against the opposition from local residents, Chevron announced in December 2013 it had cancelled the port and shore facility. At the beginning of 2014, the Tha Sala community was named as the winner of the National Health Commission (NHC) award for 2013. The NHC secretary-general encouraged other affected communities to follow the Tha Sala people's footsteps by conducting community health impact assessments themselves too in order to support their cause. Apinya Wipatayotin, Locals fight Chevron's deep-sea port. 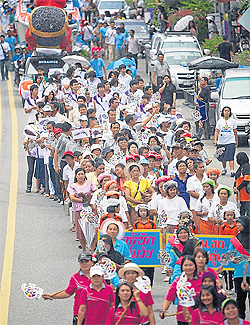 GOVT SLAMMED FOR APPROVING ENVIRONMENTAL REPORT WITH 'INCORRECT INFORMATION', Bangkok post, 4 November 2012. Residents join a ‘Fish for Life’ march Residents join a ‘Fish for Life’ march. They are seeking a food protection zone for their area and have pledged to protect a 30km stretch of coastline from ‘dirty’ energy developments.